I have been wondering what the vallon Vmh3cs mine detectors are like at the beach. Reviews have been conflicting. Some say good others say bad. Who do I believe? Guess I will find out soon enough. Have one due around 22 Nov. I understand that Eric Foster is dabbling with one of these. Trying to tweak it for gold I guess?? The Vallon is in Canberra, so I should receive it today. So Adrian, what do you think of the Vallon? Oh it was interesting enough to make me want to try one out. And what made you spend your hard earned cash on this dubious machine? It was the fact that it is built tough for the military and seems to be very sensitive to small items. I can see that everyone is busting to find out how well or badly this detector works. Yes it is astounding the amount of interest there is in this tecta. Thoughts are not real flash at the moment coz the bloody thing does not work. adrian ss wrote: Thoughts are not real flash at the moment coz the bloody thing does not work. I'm sure that you will work it out adrian. You might just have to learn another language. No tones, nothing. No battery check tones. You didn't buy it from a Chinese or North Korean company didi you? It might have spyware incorporated in it. The valon is made in Germany. Well bugger me! This thing is working perfectly and is seriously sensitive. Problem was embarrassingly simple. N I refuse ta say wot the prob was other than I have a very red face. and if you buy one of these, remember to do the battery compartment cap up tight The circuit is not completed through the battery cap spring, it is completed when the metal plate in the cap contacts the battery compartment housing. Will start a few quick tests now. Wow! I am going to be digging some deep holes. Too much EMI in my lounge and need to set Sens at 50% but still getting very good air test distances on coin and some gold chain. At first try it seems to match the SDC on my small chains but won't know for sure untill I get this tecta to an EMI quiet area. Either way this detector is looking good for beach work. There is a high Iron mineral setting that I will give a tryout later down the track. Give me a few days and I should have this baby sorted out. Sure sounds promising. What size coil is fitted to it? Coil is 6.5 x 12 inches mono. There is a larger round mono avail but I do not know the size or availability. Audio is from a built in speaker and a single military style piezo earpiece that attaches to your head/ear with velcro and webbing straps. There is a data logger output which no doubt is handy for mapping a mine field. 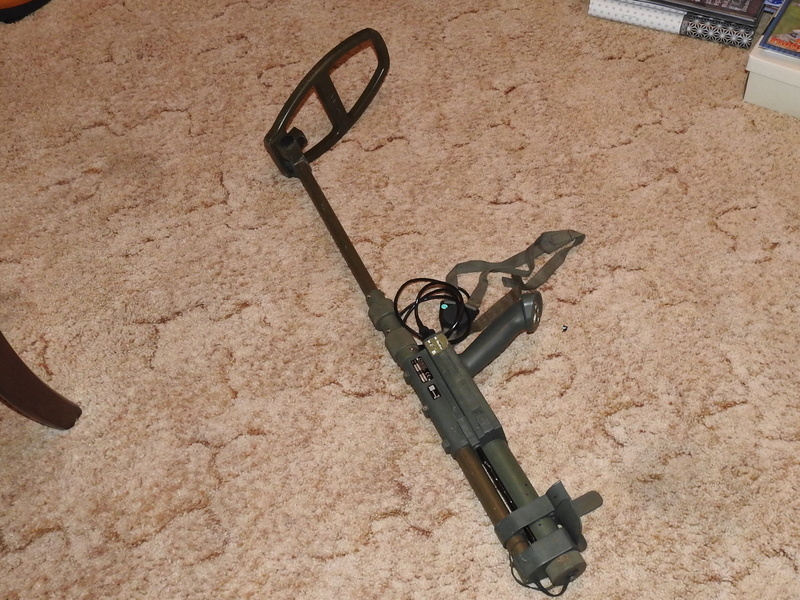 The detector is supplied in a military style back pack. I tried the tecta on some small nuggs and it had no probs down to 0.15g at 50% sensitivity. I don't have any smaller bits. Tested response to a couple of large ironstone pieces. The detector responded to these in the Normal mode and Mineral mode although I have not tested the ground balance yet. There is Auto and manual GB. Target indications are by Audio, Vibration and LED in selectable varied combinations. Power Supply is from 3 x D cells.that will reportedly, run the detector for approx 18 hours. Tried the detector in the back yard and had to switch to the mineral selection (for iron mineralised ground) but did not have to ground balance and had to set sens at 5 (out of 14) to off-set the EMI in the yard. The detector still located my test patch coins with ease. This detector is impressing me. But do not rush out and buy one for gold detecting yet because I do not know how well it will handle extreme iron minerals. May possibly be ok in mild ground. My back yard is quiet ground. As a salt beach machine at a second hand price of 255.00 + 101 AU dollars express freight from India (my ebay price) I can see it being hard to beat on value for money. This tecta goes deep. Pinpointing is good in pinpoint mode but in normal search mode targets seem to pinpoint under the centre of the rear section of the coil. Gave the Vallon a try at pine Island. The Normal mode was a bit noisy over the dry sand. Mineral mode was very good and signalled strong on one dollar coins at 12 inches+. and steel bottle caps at 14 to 18 inches. 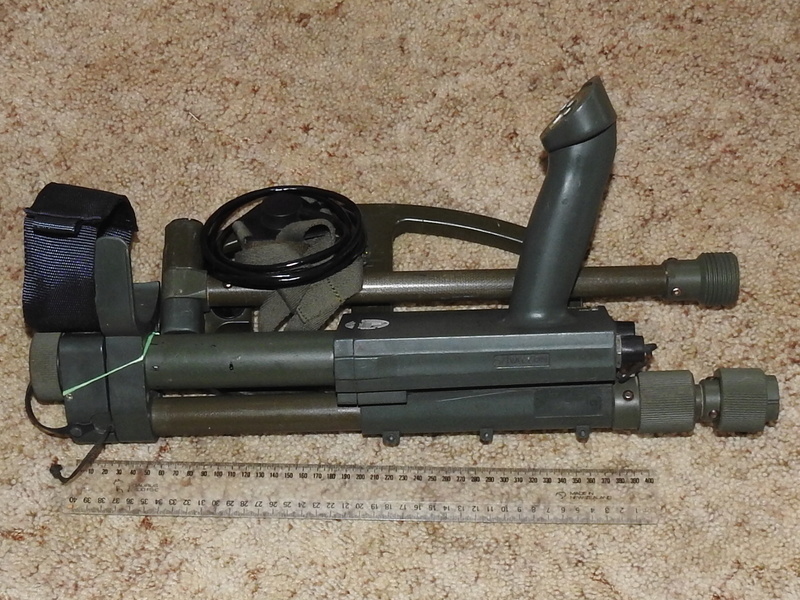 Pinpointing was a bit vague for a mine detector. The tone is high frequency and becomes annoying after a while. This tone becomes very very annoying. The detector is heavy and slightly unbalanced at 5.25 pounds. It needs normal HPs. although the military earpiece can be worn under yer hat. The arm rest requires a support strap. The Elbow Cuff slides along the battery compartment tube as you swing the tecta. Annoying but an easy fix. No EMI cancel that I am aware of. Runs a silent threshold but I doubt that the detector misses much from the surface to China. Very small targets trigger the audio. Very sensitive to small targets. Close to matching the SDC on gold chain above 6g. Stronger than the SDC on Aussie coins. by approc 25%. Remembers previous settings after switch off. (Ground balance and sensitivity) in Mineral mode only. The Normal mode is fixed and only sensitivity can be altered. Water proof coil to a metre and a bit. Punches through rocks that stopped my safari........Doesn't take much of a rock to stop the safari. Has Auto and manual ground balance......Only functional in the Mineral mode. Really good machine for dig it all salt beach detectorists. You will be digging deeper than with the Inf, Sov, SS, Sea Hunter and possibly the Dual Field. The SDC is much better on light weight gold chain from approx 6g to smaller than 2.5g than the Vallon VMH3CS....That does not make the vallon bad. Current draw is approx 400ma which is a bit heavy but the batteries seem to run the detector for respectable time. I do not know what the shut down point is yet. Just an opinion. Not gospel. I will post more info as I gain exp with this machine. That could be debated. The ATX is very good on gold chain. Why use a PI for gold chain searching at the beach when VLFs like the Gold Bug n Red Racer etc can ground balance to the water line and Are much more sensitive than the 2300 plus it(the gold bug) has TID in the All Metal mode. The PIs come into the game when you want to get out into the salt water or if you want to find very deep items in the dry sand areas. Wasn't aware the GB and Redracer were waterproof. I dig all on the beach/wet sand as most TIDs arent overly accurate there. The GB Pro is not waterproof but it can be used to the water line and into shallow water, just don't drop it. The All metal mode of the Bug Pro is very good and the tid is ok and seems to be better than a lot of VLFs over wet sand. I know I have recovered 20 cent coins at between the surface to roughly 18 inches in water line wet sand and one at approx 2 foot in the dry with the Gb Pro and the 11 inch eliptical DD. You have to hit the ground grab button a few times as you move from the dry to the wet sand and then you can manually Ground balance to bellow zero if necessary as the coil gets covered by a few inches of waveletts. The Disc mode of the Bug Pro is near on useless over the wet sand so don't even think about using it......remember that the All metal Gb mode has full TID. Yes PIs are at their best in the salt and is why I swap from VLF to PI as I go into the deeper water. You can use a PI over the entire beach but unless you have an SDC or ATX or possibly the Vallon VMH3CS or something similar then you will not find the light weight and some not so light weight gold chains or fine jewellery items like broken rings and ear rings and toe rings etc.... Sil chain hits much harder than gold chain. The SDC will only find the small chains bellow 6g from the surface to approx 3 inches in the sand whereas the Bug will ping them to at least from the surface to 6 inches. I have an 2.8g 18k gold chain that the SDC can see at 2 inches and the Bug can see at 5 inches and a 22g 9k gold chain that the SDC and Gold Bug Pro can both see at 27cm 10.5 Inches) with the SDC at max sens in salt mode and bug at 50% sens in All Met mode. The EMI was messing with the BUG so I had to wind the sens down a bit. Ordinarily the Bug would loose a bit of depth over the ground compared to "In Air" but I am not convinced that is the case when ground balanced over wet or dry beach sand....I may be wrong although in field results have shown otherwise. Gave the VMH3CS Ground balance a run in mineral mode this morning. In the Mineral mode the detector was able to quieten some significant slabs of maghemite and ironstone to a level where I could hear easily, some 0.63g to 1.2g nuggs through 1.75 inches of solid maghemite ......Single slabs of rock do not equate to gold field conditions where the entire ground to significant depth is ironstone.. but even so, most of the detectors that I have tested over these rock samples that have been able to ground balance them to near on silent have performed reasonable well over mild to hot ground. I figure that if you have one of these tectas then it would be worth giving it a run in the gold fields. The manual states that the mineral mode can handle laterite and magnatite......It appears that it can. I have noticed that all of these VMH3CS detectors that I have seen up for sale have the left side elbow cuff tab broken off. So without modification this tecta is capable of finding some small shallow and large deeper gold in fairly tough ground but at the same time it will find every tiny bit of rusty iron. 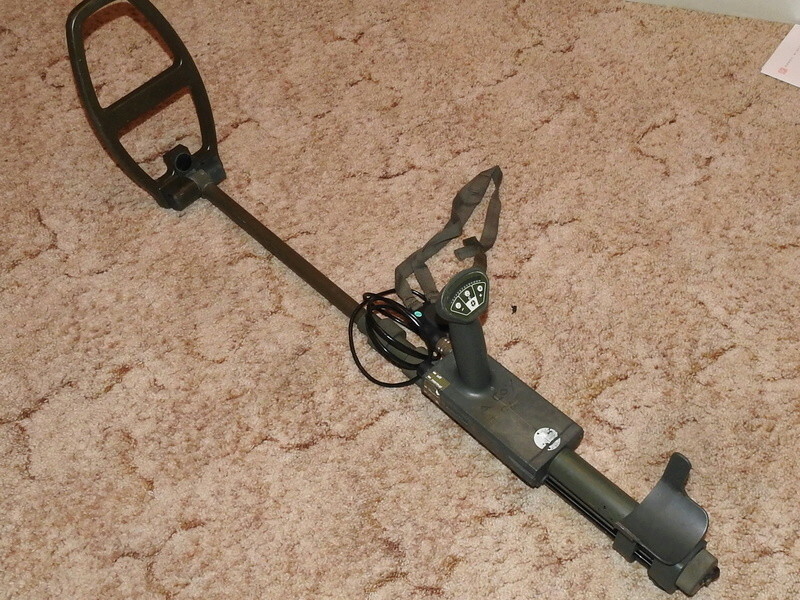 The vallon VMH3CS is rapidly proving to be a very capable metal detector and I have no reason at all to think it would not work well in our gold fields. This tecta has been around for a while and I am surprised that more people have not given it a go on the gold. plastic mines with minimum metal content as well as other small metal parts. Unquote. Took the Vallon out again this morning and now that I have got the hang of the ground balance I can say that this detector can handle some fairly nasty ground in the Mineral mode.... This detector is way more versatile and capable than what you would expect from a Military mine detector. Located a single 0.13g broken sil chain link this morning at approx 5 inches. Signal was clear....It chirps quite well on a 0.15g nugg at around 4 to 5cm. Sweep speed can be fairly fast or slow and still achieve good detection but it is likely better to slow down while looking for very small items. Very thorough report Adrian. Are you close to any goldfield to try it out? cheers Pete. Yes a few places I can get to, they are not very mineralised and the gold is mainly reef gold that is out of reach but some of the creeks have some bits stuck in the bed rock cracks. Also some spots along the South coast but I probably won't be going into those places. I am getting too rickety. Back from trying the Vallon VMH3CS at the beach. It works very well and is sensitive and deep searching. Response to Aussie one and two dollar coins is exceptional and locates these coins in wet or dry sand from the surface to better than 15 inches with a fair signal on the deep coin. Bobby pins and steel bottle caps were a pain because the detector has strong response to ferrous items. I guess being a mine detector the pulse timing is set for this type of metal. But at the same time the response to small gold items is very good while not being as deep on the larger deep gold items as you might think it would be. Normal mode can be used anywhere on the beach and does produce some weak false signals in the wet sand that is not a problem. Curiously the Ground balancing Mineral mode was more noisy than the Normal mode over the wet sand. Even though with the GB well set and with no response when the coil was bobbed up and down above the sand, the detector false signalled a bit once scanning was commenced....Not sure why that was the case? I was able to run the sensitivity at 12 out of 14 (Led Display) and could have run at max but at that setting in the water I found the false sigs to be annoying. The ground balance was not driven to max low (Salt sets low and Iron sets high) over the wet sand and there was plenty of range remaining......Maybe it would handle dry salt lakes ?? Just guessing there. The 5.25 pound weight of the detector was not a problem and I was able to swing the machine for a couple of hours before my arthritic elbow said give it a rest. The weather was a bit stormy and the tecta likes lightning and was pinging quite loud on strikes that were approx 30 k distant. I left the beach when strikes were too close for comfort. It was raining and the tecta did not seem to mind although it would be wise to not let the HP socket get wet or submerged in salt water. I might add though that this detector is a few thousand dollars new. So I guess it is far from Low end. Even if you don't use the back pack to store it.It does not take up much room. I put the The bit of string around the elbow cuff is to stop it sliding along the shaft while swinging the tecta. There was no elbow cuff strap so I fitted a velcro strip on it. It appears that I may have not been using the correct ground balancing procedure and this may account for the false tones over the wet sand. Good report Adrian thanks. I’m guesting its waterproof. No I wouldn't drop it in the water. The ear piece connector is definitely not WP. Also the battery compartment end cap is not WP and I would not put a lot of faith in the centre shaft connector. The coil is wp to wading depth. Vallon do make a water proof PI but the VMH3CS is not it. The detector might handle a momentary dunking but I am not going to test it. I suppose that smearing some silicon grease/sealer around the threads of the centre shaft connector and battery comp end cap threads would be a good idea if you plan on taking it into the water.....My unit had silicon grease on the threads when I received it. I removed it when cleaning the machine up a bit because I thought it would get sand stuck in it. Air Test at max sensitivity. Salt mode at max sensitivity. Clearly the vallon is better for coins at the beach. The SDC is better for gold than the Vallon........Makes sense cos the Vallon is a mine detector with Pulse timing optimised for iron/steel and the SDC is set up for small gold. Max sens Normal and Mineral mode = nil response to chain. The clasp detected at 2 inches. SDC 2300 Max sens in Normal and Salt mode = weak response at 1 cm. The clasp detected at 4 inches. Like this detector so much I bought another one....One for each hand. tdm_electronics reliable seller ships fast. HMM. It seems that this tecta is missing some O rings that make it WP to shallow depth. It is a fairly simple matter to fit rubber O Rings to the battery compartment end cap and to the shaft centre section connection. I did purchase second one of these metal detectors (coz I really really like it)and the second one has the O Rings fitted. So I might give it a dunking and see what happens. Well I guess you could do that But sounds a bit drastic to me. I don,t know what pressure the case and hand grip can tolerate.Not to mention the LED display. That would be embarrassing to pressurise the case and see the display plate fly off. If you just have to put a pressure valve in the case then make sure it is a goodun and that you don't crack the case when drilling. Any hole will create a weak spot. The Vallon ground balances my slabs of ironstone better than my Infinium and the SDC2300 and will still ping some gold nuggs down to 0.15g and lower through these slabs. I said it once before that if you have one of these tectas and you have mastered the ground balance procedure then give it a run in the gold fields. It is a pity that I am just talking to myself re this detector. I know how good it is and there is plenty of discussion going on re Vallon Mine detectors around the worlds coin, relic and gold detecting forums and it is all good. Went to the Coast for the weekend and gave the Vallon another run. Did not find a lot but the tecta performed very well and was finding 1.8g lead sinkers (A stop and dig me signal) at between 8 and 10 inches in the wet sand. Sens at 70% and in Mineral Mode. Most of the coins were old and deep. Nice easy to use detector.